A couple of years ago, a friend of ours dropped by and gave us some tear sheets from a German magazine featuring Takako Iwasa's FASHION CATS. We loved them so much, we pinned them up on Daniel's inspiration board. 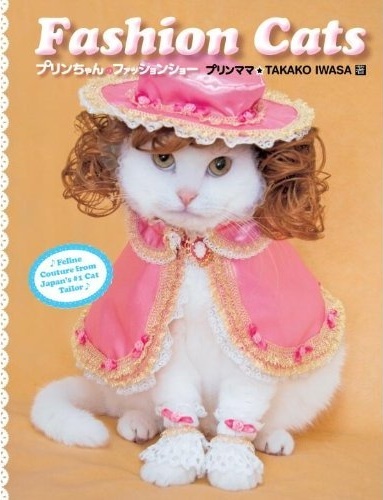 And then, a few months ago, we discovered Takako had done a whole book featuring her cats dressed up in seriously cute outfits. Obviously, we had to have it. (And if you have to have it too, check out the official FASHION CATS book website - it has a video). As fate would have it, I did manage to find a reindeer hat on deep discount after Christmas at PetSmart. Emmy, as you see below, was none too pleased by her gift. I think most cats would react like Emmy. It's funny that those cats in the pictures look so complacent about being all dressed up and having things on their heads, when like Sandy and Kathy mention, my cats would try to run away or bite me if I tried to put something on their heads. I guess it's all about the animals and their tolerance level, but I do wish that my cats would let me dress them up! This is equal parts alarming and AMAZING, Lenore. 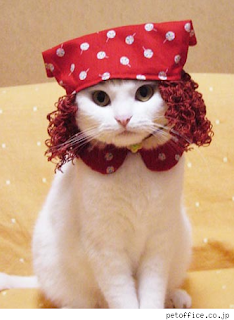 You say Anne of Green Gables, I say Antoine Dodson. That was the first thing that sprung to mind. Jen - The author says Anne, but you may be right, lol! Most cats do not like anything on their head unless they put it there themselves such as a blanket. How cute. My library has two donated copies of this book - one in the kids room and one in the adult collection - it's pretty ridiculously cute. The wigs kill me! :D Poor kitties. What those poor cats must endure!! LOL!! OMG! Too funny! I don't think Emmy is very happy with you!!!! Oh, she looks so offended! It reminds me of the looks the cat gives at the end of the "Cats and Dogs" movie (that my kids just love).